Greg Etzel was born on April 9, 1936, in Brooklyn, New York. He was commissioned a 2nd Lt through the Air Force ROTC program at Rensselaer Polytechnic Institute in Troy, New York, on June 7, 1957, and went on active duty beginning February 27, 1958. Lt Etzel next completed pilot training and was awarded his pilot wings at Craig AFB, Alabama, in April 1959, followed by Helicopter Pilot training at Stead AFB, Nevada, from May to October 1959. His first assignment was as an SH-21B Work Horse helicopter pilot with the 46th Air Rescue Squadron at Otis AFB, Massachusetts, from November 1959 to March 1960, and then as an SH-21B Rescue Alert Pilot with Headquarters Air Force Iceland at Keflavik Airport, Iceland, from March 1960 to March 1961. 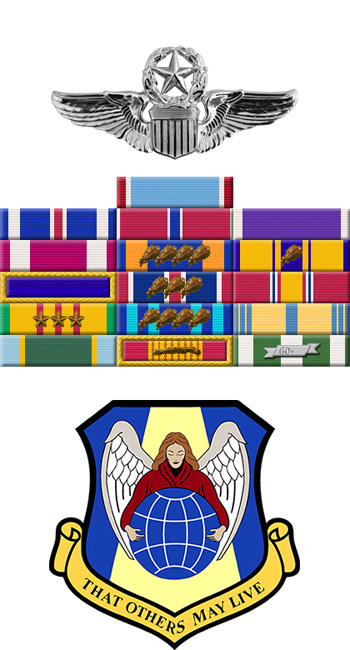 He then served as an H-21 and then CH-3C Jolly Green Giant pilot with the 1371st and 1375th Mapping and Charting Squadrons at Turner AFB, Georgia, from March 1961 to June 1967, followed by service as an HH-3E pilot with Detachment 2 of the 37th Aerospace Rescue and Recovery Squadron at Udorn Royal Thai AFB, Thailand, from June to October 1967. 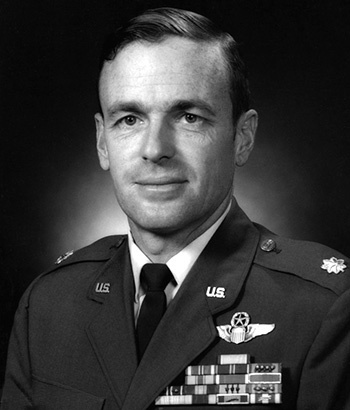 Capt Etzel next served as an HH-3E pilot with Detachment 1 of the 37th Aerospace Rescue and Recovery Squadron at Nakhon Phanom Royal Thai AFB, Thailand, from October 1967 to July 1968. He then attended Naval Test Pilot School from July 1968 to June 1969, followed by service as an Aerospace Research Flight Test Officer in the VTOL Section with the Air Force Flight Test Center at Edwards AFB, California, from August 1969 to August 1973. LtCol Etzel served as an HH-3E pilot and Operations Officer with the 1st Aerospace Rescue and Recovery Squadron at McClellan AFB, California, from August 1973 to April 1975, and then as a Flight Test Officer with the Flight Test Engineering Division, 6510th Test Wing, at the Air Force Flight Test Center at Edwards AFB from November 1975 until his retirement from the Air Force on July 1, 1979. Captain Gregory A. M. Etzel distinguished himself by extraordinary heroism in connection with military operations against an opposing armed force in Southeast Asia as an HH-3E helicopter pilot on 2 and 3 July 1967. On the 2nd of July, Captain Etzel flew his helicopter into one of the most heavily defended area of North Vietnam to rescue a downed F-105 pilot. Unable to effect a pickup because of oncoming darkness and intense small arms fire that damaged his aircraft, Captain Etzel withdrew from the area. After landing at a friendly base, he volunteered to continue rescue operations the next day. After minimum rest, he took off at first light and flew through intense automatic fire, dodged deadly missiles, and evaded attacking MIGs in search of the downed pilot. In the face of heavy small arms fire that severely damaged his helicopter, he located and rescued this valuable pilot. Through his extraordinary heroism, superb airmanship, and aggressiveness in the face of hostile forces, Captain Etzel reflected the highest credit upon himself and the United States Air Force.